Yesterday, I took the ferry from Peaks Island, where we are staying for a short vacation in Maine, into Portland. Growing up in South Portland, I learned to climb on the local sea cliffs and spent a lot of time climbing at Fort Williams in Cape Elizabeth. The rock is a very featured and fragile metamorphic type offering all kinds of holds and moves, typically in a gorgeous setting. Deep eroded pockets and extruded fins of gold quartz are common making unique and interesting holds. 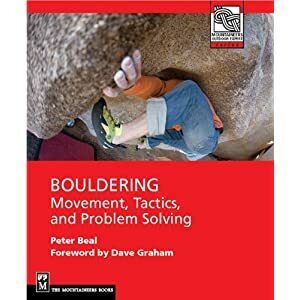 Though the climbing is not worth a trip unless you are already in the area, it is very different from the more typical granite in New England and I have no doubt that this kind of climbing made me more focused on bouldering as a climber overall. 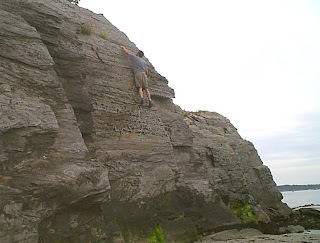 I started at an area in South Portland that I actually first climbed at when I was about 10, soloing a fairly tall 5.7 wall when I was wandering along the shore with friends. Although I didn't start climbing seriously until a few years later this was a really transformative experience for me, making me in the end the person I am today, still deeply involved in climbing and the natural world. Climbing this wall alone, ground-up, with no idea what was ahead, instilled in me the idea that something was special about the act of climbing, something that has stuck with me since. Here is a still from video I took of doing this route on this visit, at least 20 years since the last time I climbed it. Another important climb I did, this one a bit later, was on an adjacent formation called the Anvil, a striking 20-25 foot roof. I have rarely seen anything quite like this anywhere else I have climbed. A great jug haul leads to a committing reach at the top off very loose holds. It still tested me when I did it this time. Somewhere I have a picture of me on it at the age of 14 or thereabouts, painter's pants and EBs casting off up this amazing problem. I did a few other problems that were standards for me when I climbed here regularly in my teens in the late 70s, mostly in the V2-3 range, with good movement on steep terrain, climbing more like limestone than anything else. In a very real way this area served as my local climbing gym, even down to the cushy landing on deep sand. Sadly, the terrain was so featured that harder climbing was not really feasible, limiting my ability to push limits further, but nevertheless it was a great training ground. I was interested to see traces of chalk visible and am pleased that people still climb here. I will have a video of some of the problems up shortly. After this I went over to Fort Williams to do a little climbing underneath Portland Headlight. There is an excellent slightly overhung 12' wall with numerous problems on it, some a bit committing due to the width of the shelf below. I spent many hours here developing problems and climbing them repeatedly. 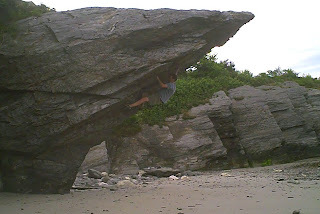 Again nothing really hard here exists, with the hardest clocking in at V7 or V6 but the position is superb and in summer, once the sun is off the wall and the sea breeze kicks in, you are experiencing probably the best conditions south of Bar Harbor. I climbed most of the best problems here including the traverse and called it a day and headed back for the ferry to Peaks Island. In a way every time I come back to these areas, I am revisiting my childhood and the memories of the places and people from a different time. However it doesn't feel nostalgic but more reaffirming of the value of choices I have made to be a climber. Even as I have followed different paths in life, this theme remains constant. Glad to hear you had a chance to visit your climbing roots. I too get a kick out of swinging out to Portland Head when I'm in town -- takes me right back to those early days. One of these days I really want to get up to Acadia again. It has been quite a while. As a new Portlandite, it's really cool to see there are some fun problems in the neighborhood. So far, most of our bouldering adventures have brought us to Bradbury and South Freeport where some other cool but painful problems lie. I was wondering if you could help direct me to the Anvil (which could be one of the most aesthetic lines i've seen in maine). Thanks for your help and keep up the good work.